What Day Of The Week Was January 20? 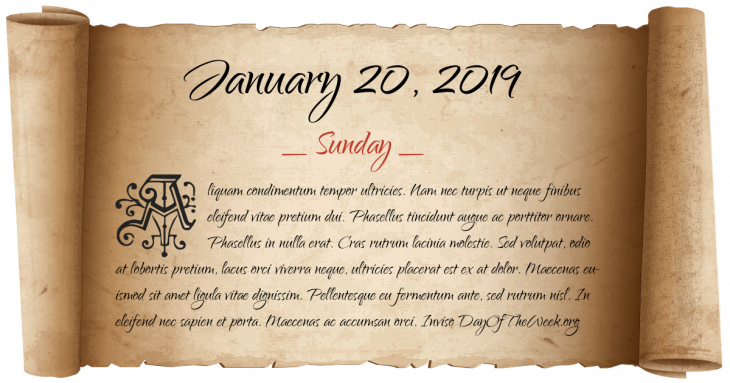 January 20, 2019 was the 20th day of the year 2019 in the Gregorian calendar. There were 345 days remaining until the end of the year. The day of the week was Sunday. In the ancient astronomy, it was the cusp day between Capricorn and Aquarius. In some years it is Aquarius, but others Capricorn. It depends on the year. Emperor Decius begins a widespread persecution of Christians in Rome. Pope Fabian is martyred. Charles I of England goes on trial for treason and other “high crimes”. The Kingdom of Great Britain signs a peace treaty with France and Spain, officially ending hostilities in the American Revolutionary War (also known as the American War of Independence). L.A. Thompson patents the roller coaster. In Old Arizona, the first full-length talking motion picture filmed outdoors, is released. Edward VIII becomes King of the United Kingdom. Pakistan launched its Nuclear detterent program few weeks after its defeat in Bangladesh Liberation War and Indo-Pakistani War of 1971. The China News Service announces new government restrictions on Internet use, aimed especially at Internet cafés. Who were born on January 20?